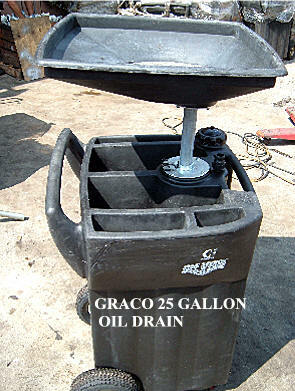 Graco heavy duty evacuation pump. Model "HUSKY 1040"
WE HAVE SOME BEAUTIFUL USED UNITS AVAILABLE AT LOW COST. By Using The Bilstein R-200 Engine Flush System You Obtain a Very Clean Engine, Which Means Better Performance, Superior Fuel Economy and Longer Engine Life. 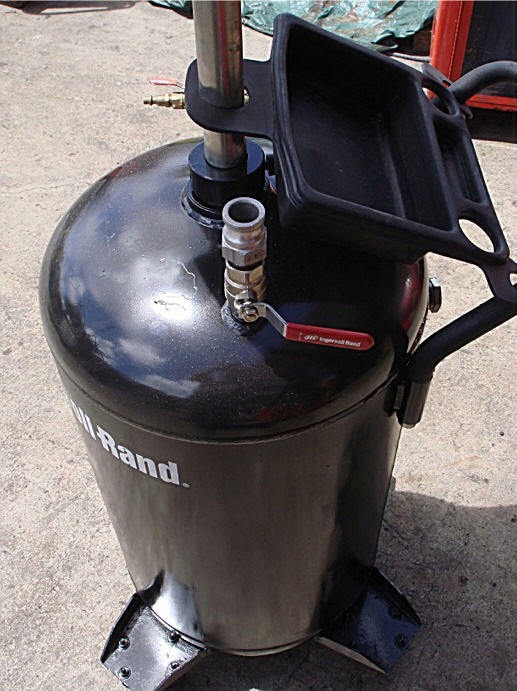 The Service: The Bilstein R-2000 Engine Flush System utilizes patented adapters and specially formulated solution to dissolve and evacuate accumulations of sludge, tar, varnish, and wear metals. The 10-minute service is performed with the engine off. Using pulsating pressures, the Bilstein R-2000 Engine Flush System circulates a specially formulated, heated petroleum-distillate solution over the main bearing, through the oil passages , over the valve train, and to the oil pan. Sludge, contaminants and residual engine oil are evacuated from the oil pan under vacuum. After extensive research and testing, the results have shown the periodic sludge removal restores operational efficiencies and reduces harmful exhaust emissions. By reducing wear metals and corrosive contaminants, longer engine life can be expected. The Bilstein R-2000 Engine Flush System Allows The Technician To Completely Flush The Internal Lubrication System Of The Engine With The Engine Off. Bilstein R-2000 Engine Flush Service is completed in just 10 minutes. State-of-the-art touch screen display with self diagnostics and automatic prompts. Standard equipment includes our patented quick-disconnect standard adapter system. Bilstein R-2000 Engine Flush Service is a patented process. Fully Automatic operation once connections are made. Bilstein R-2000 Engine Flush Service back-flushes the oil pickup screen. 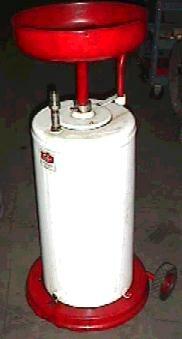 High Flowing dual-pump system utilizing both pressure and suction. 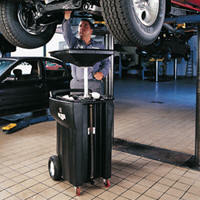 Utilizes Fluid-flwo meter system that eliminates the possibility of engine overfills. Power 110V/shop air 75 psi min.